Western culture’s emphasis on seizing the day is so part of our experience I do not believe we fully comprehend what stress it adds to our everyday life. The latin pronouncement, Carpe Deum, as so powerfully played by the sorely-missed Robin Williams, is a command that arrested my soul when I first witnessed it. You can watch Carpe Diem explained by them him in the brilliant movie, Dead Poet’s Society. Unfortunately, I’m not sure he was providing good instruction. How does one seize the day? His answer: be extraordinary. Can we all be Jeff Bezos or Bill Gates or a Hollywood Star? If being famous or rich is not the message, then what is? If you’re not familiar with the movie, the setting is a boy’s boarding school, which is very expensive and exclusive, has one character that doesn’t want to go down the path he’s on. He wants to be an actor, and his father, who wanted him to be a doctor, isn’t happy when he finds his son playing in a Midsummernights Dream. I won’t give away the ending (mystifying if you haven’t seen it). The message is that you better seize the day by grabbing onto the path that you want. He stares down a bunch of old photos and tells them – “these guys are pushing up daisies now”….what are they telling you? Carpe Diem! But how does one know they’re seizing? I propose we’re not trying to stop time or an ill-defined extraordinariness. We get carpe diem by directing our own path and by discipline. Alan Watts puts it very well in this video. He talks about how to have a happy life and claims that learning a skill as one of the most intense ways of achieving happiness, preferring that word to the word Discipline. I think this is a healthier way of going about it, and if you’re familiar with the Dead Poets Society you’ll know that it has an unhappy ending that could have been avoided if the characters were able to avoid holding onto outcomes so strongly. Therefore, to live an extraordinary life, we’re not to seizing anything. The opposite of seizing is letting go. We don’t necessarily let go of all the days, but some days life will assert itself. Some days you’ll need to be studying calculus, and not want to. Perhaps you’ll be pulling weeds (for that coming party), or painting your garage door(so you are proud of your house). Are those tasks seizing the day? Hardly. But your learning your discipline. You’re building your future by sacrifice now. And then, of course, the chaos fo the natural world has its way with us. Illness, poverty, injustice – all of them circle us always. I think a perfectly good use of a day is to fend those things off. We discover then that carpe diem is fine, but it does not mean “Be extraordinary every day”. It instead means to direct your path today so that your tomorrow can be even better. So maybe the phrase should be carpe diem for tomorrow. I learn that chord today so that I can play that song tomorrow. Throw that football a thousand times today so I can throw it further tomorrow. Learning is difficult, possessing a strange mix of unpleasantness and enjoyment. We recently redid our bathroom. It was exhausting, but at every stage, I found enjoyment in a new accomplishment, and in the act of learning. Now we have a fully modern bathroom and I’m getting the double dose of joy out of using it and showing it to others. Did I meet the “extraordinary” criteria? I mean, would it be more extraordinary to hire someone? Probably not. So seize the day does not mean riches or fame our anything the world gets a vote on. Extraordinary/seize the day means simply to direct your path in a meaningful way. And don’t hold it too tightly either. I’ve used the show American Idol many times in my writing. Once again this season was full of shining young faces that could sing the paint off of a wall and make it dance. Only one, Maddie, won ( good choice, America!). Did the rest of them fail? Were they not extraordinary? So it is in the going that makes you extraordinary, not in the outcome. Life is ridiculous. We have such a short time here, and it takes forever to figure out the world and your ever-changing self in it that by the time you even get a sense of who you are you might think it too late. It’s very important to not take life too seriously. If we hold too seriously to expecting to extraordinary we are bound to be sad. Not everyone can be extraordinary. Indeed its built into the word. Ordinary is the great mass of humanity, and extra-ordinary is beyond/above/better than that. It’s quite unfair to expect that since it excludes nearly everyone and it’s intensely subjective. An actor is no more extraordinary than a doctor and no less. That’s a house that we can all move into. This series 🆆🆃🅼 – What’s the Meaning ? will be selecting some of the most influential entertainment sources from our current epoch and evaluate what the writers are trying to communicate. What’s their truth and does it line up with yours? 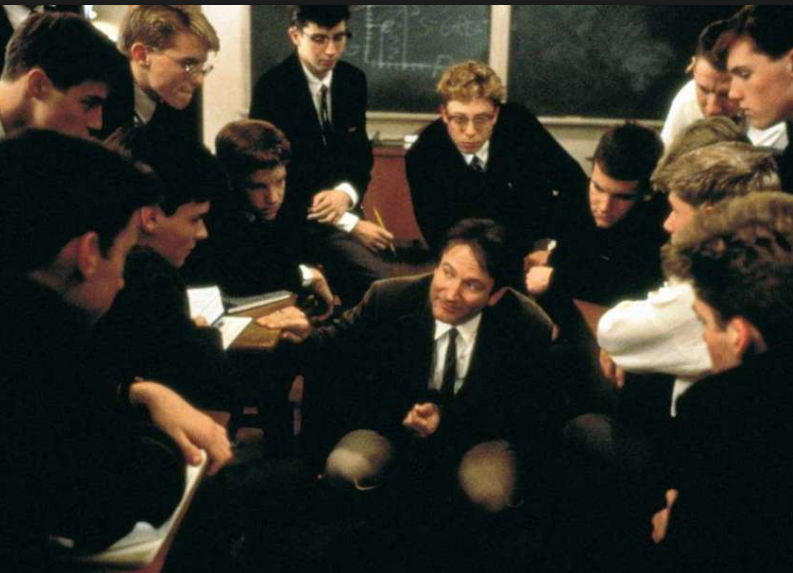 What can be improved, even on great works like the Dead Poets Society? What is the most important Netflix, HBO, or Hulu series right now? What should we, a community of those trying to be better, analyze?